Sri Raadhe Chills and Thrills is popular for its fast food, chaat, and desserts. It is frequented by college goers and families alike. Opening its shutters at 12 pm, this small eatery functions until midnight and has its peak hours from 6 pm. With a pani puri stall outside, and neatly arranged seating area, it is nothing fancy but rather a budget place that makes incredibly good food. If you would like to sit indoors, there’s space for a small group. 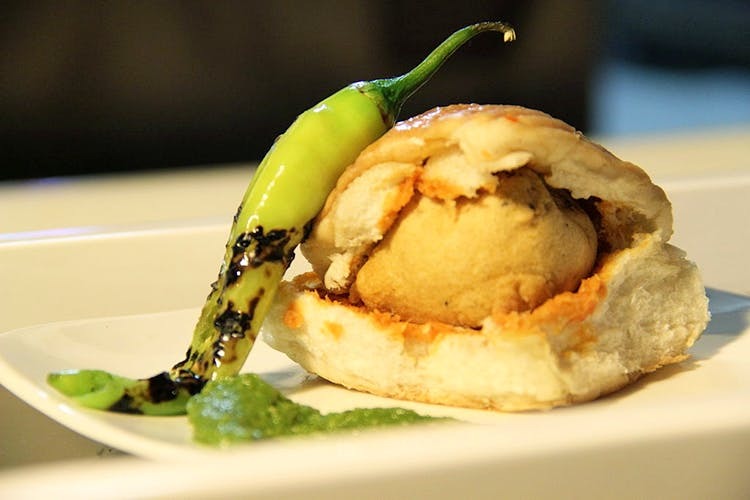 Their menu has everything from vada pav and dabeli to pizzas, pasta, and Indo-Chinese dishes. Skip the pasta and pizzas to dive straight for the chaat, and fast food. They have various counters within the limited space for each kind of food, so place your order at the cash counter, collect a token and go to the respective section for your food. Merely watching the pav being tossed on the tava to a sandwich being stuffed and grilled with extra cheese had us drooling, and we’re glad the wait wasn’t too long. Among their various types of sandwiches, we went for Bombay Cheese Grilled Sandwich, which was hot and dripping with cheese. The two slices had a fine texture from the grill lending it a crispy taste that we loved, with filling vegetables and chutney stuffing inside. We also got vada pav and we swear it’s the best we’ve had in Hyderabad (very much like the authentic Bombay ones, no joke!). It has just the right amount of spice and will have you coming back for more. The Chinese food here has its own loyalists, with a whole bunch of people ordering Schezwan Noodles and that’s one counter which is always full. To end your meal with something sweet (or if you're here with kiddies), have their Magic Pop ice cream made out of vanilla ice cream and topped with sizzling sprinklers and nuts. For something simpler, there's always classic kulfi. The outdoors are not the cleanest and the place can get pretty crowded.